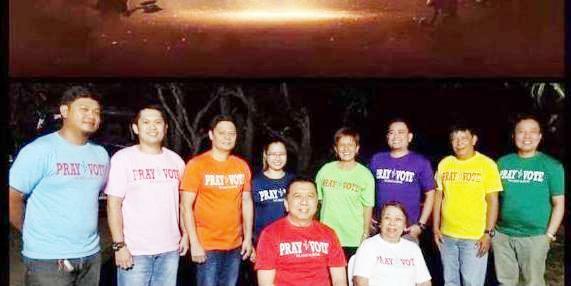 CANDELARIA, Quezon – A new advocacy group urging the residents here to pray and vote for the coming May 2019 elections has called for the creation of prayer brigade to lead the prayer movement for a true and successful elections. “Ang mga nagtataguyod ng Pray and Vote Advocacy ay humihiling na tayo ay magkaisa, lumahok at magpalaganap ng ating Panalangin sa pamamagitan ng pagdarasal at pagbubuo ng Prayer Brigade na mangunguna upang maging makatotohanan at matagumpay ang halalan sa Mayo 2019,” said the group in a statement led by former mayor Ferdinand Maliwanag and former vice mayor Natalie Atienza who described the vicious habit in previous elections as being ruled by 4Gs – guns, goons, gold and greed – and the only way out is prayer to God. “Nariyan ang maling kalakaran ng pulitika tuwing halalan na nagdudulot ng kahirapan sa aming mga mamamayan at wala kaming lakas bilang tao na mabago ang sitwasyon. Ikaw lamang ang aming pag-asa upang mabigyan ito ng solusyon,” said the group which has affiliated with Akbayan partylist led by Senator Risa Hontiveros and Cong. Tom Villarin. Maliwanag said they are relying mainly on God in the electoral fight against the 4Gs and they believe in the application of the new rules against the old rules in politics through prayers. Both Hontiveros and Villarin have congratulated the group for the launching of the Pray and Vote movement launched last month to introduce reforms in the political process in the local elections in Candelaria, in Quezon province and in the whole country. Hontiveros has expressed solidarity with the group for the launching of a civic advocacy that proposes God-oriented reforms for the voting public. Villarin said that Akbayan partylist hopes that through prayer and the Lord’s guidance, the people of Candelaria can manifest their hope, courage and conviction in choosing the rightful candidates that would serve as allies in addressing the various challenges in the coming years. Other members of the group aside from Maliwanag and Atienza are candidates for municipal councillors, previous and incumbent barangay officials and prominent citizens of this town. They are identified as Dindo Salas, Lydelle Dizon, Julius Clomera, Panong Delos Reyes, Goring Robles, Rey Salas Galang, Jb Quilapio Baera, Bonnie Manalo, Butch Mauhay, Iko Mauhay, German Mercado, Ramoncito Maliwanag, Rodan Reyes, Noel Rigos, Maning Bunyi, Pablo Aranas, Badoy Panaligan, Belo Emralino, and Abner Caguitla. “Pagkatapos ng eleksiyon at nang sama-samang pagtataguyod ng Pray and Vote, ang kasunod nating adbokasiya ay ang Pray and Serve, paglilingkod na may pagmamahal sa Diyos at sa kapwa,” concludes the statement posted in Facebook and circulated in the town. In early October, the group calling itself Pundasyon, has held a soft launch at the conference room of FOG building here led by Maliwanag and Atienza. Pundasyon takes as its vision ‘a society of public servants and citizens with love for God and fellowmen’ and takes as its mission ‘to search, to practice, to propagate and promote truth which will serve as guide for public servants and citizens’. •Small Town Lottery legal compliance where the Phil. Charity Sweepstakes Office should give to the STL bet collectors and supervisors their 10% sales commission and to the bet winners the full P800 to every P1 bet. They proposed to have the STL operator get business permit from local government unit based on the 10% gross income of the STL operations. •Discipline for both the motorists and pedestrians to have order in the streets. •Full local government support for education, sports, senior citizens, women, cooperatives, overseas Filipino workers, health with preventive medicines for those with afflicted with health diseases, stroke, cancer and others. •Expansion of government center in Bgy. Malabanban Sur and invitation of national government agencies to locate in Candelaria. Maliwanag, who also served as vice mayor for 3 terms before becoming mayor from 2007 to 2016, believed that they have tried to serve their best for their constituents according to the usual ‘system’ of public service guided by the ‘Divine will’. Maliwanag said they are not trying to be angels aspiring to return to public governance but they prefer to be on the good side for the benefit of the millennials and the next generation. “This is a long and tough process we face and the Pray and Vote movement starts to take up the challenge for the sake of our town and our province,” he told his colleagues at the meeting.